Melancholy has no dominion in Marge’s watercolor kingdom. Nursing and software engineering might not seem like likely stepping stones to a career in art, but they were, nonetheless, part of Bride’s circuitous journey to finding her true vocation. Over the past two decades, in fact, this local and regional artist has created an aesthetically fine, even industriously busy niche for herself. A one-woman art business—which she conducts in her studio in the basement of her home-- Bride discovers inspiration all around her. And it’s not just in colors and forms, but also in the upbeat, evocative moods she conveys whenever her brush touches paper or stretched canvas. 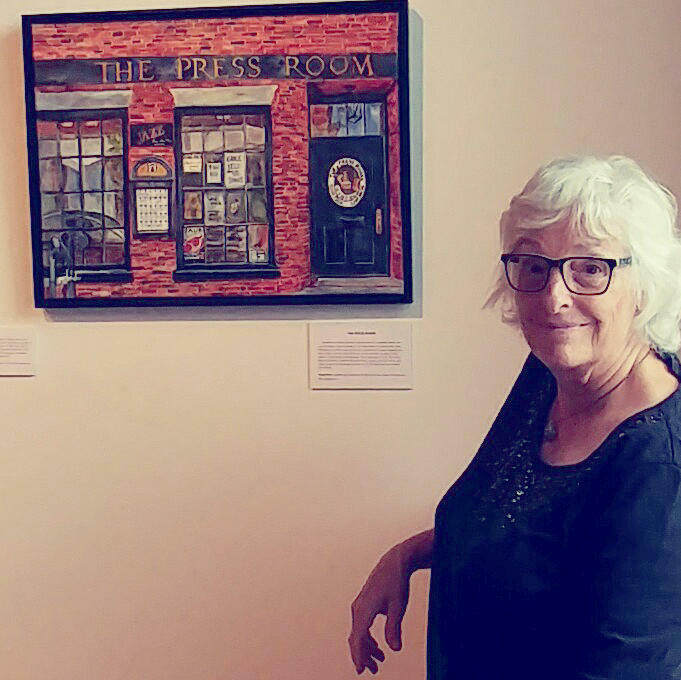 Right now, jazz themes are the Rhode Island native’s primary focus in her exhibition in her longtime hometown of Pittsfield. 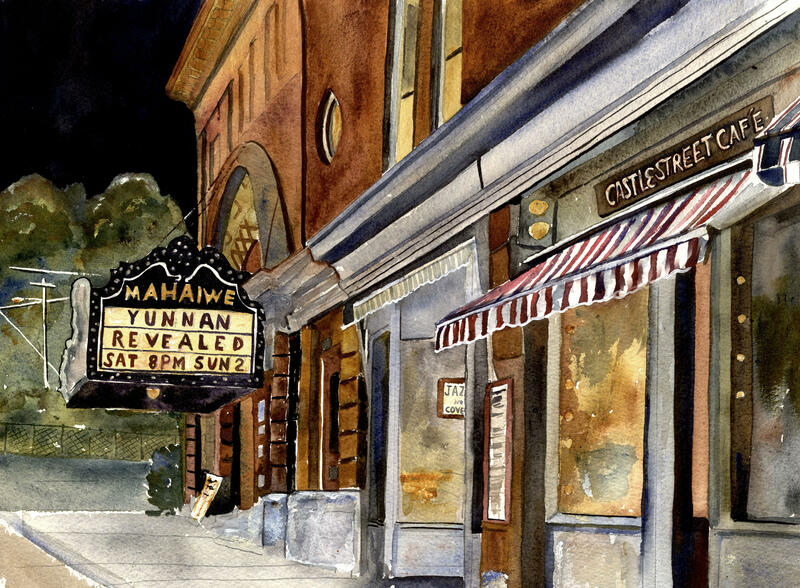 Her watercolor works in the exhibit celebrate jazz scenes from the Newport Jazz Festival to the dreamy, seductive visions of the exteriors of favorite regional jazz haunts: from Pittsfield’s Mission Bar and Tapas to the Castle Street Café in Great Barrington and the Press Room in Portsmouth, NH. Bride and photographer Lee Everett present 18 jazz-themed works apiece in the duo exhibition called Jazz Visions. It runs admission-free through August 27 at the Lichtenstein Center for the Arts, 28 Renne Avenue, Pittsfield. Bride, who was converted from an agnostic to a true believer in jazz by her husband Ed, a public relations consultant and jazz activist, has been acclaimed for her oeuvre embracing everything from seascapes to still lifes. 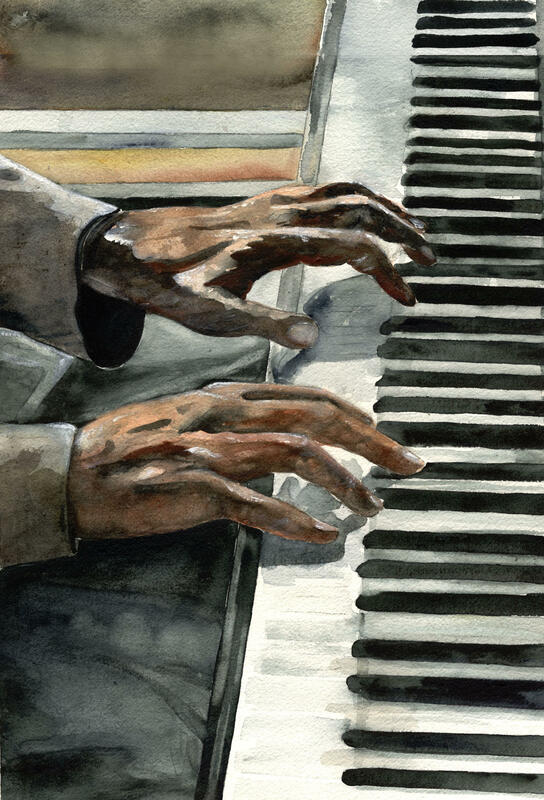 Adding jazz to her array of painterly themes was Ed’s idea. 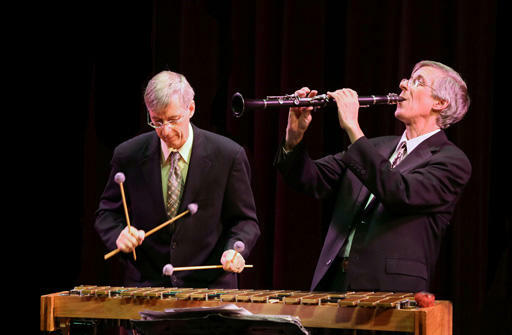 Jazz Visions was, in fact, the brainchild of her jazz-loving husband, who is president of Berkshires Jazz Inc. — the non-profit that presents the Pittsfield City Jazz Festival.
" 'Oh, dear Lord,’ I thought to myself, 'do I have to listen to this for the rest of my life?' Marge joked of her fear of being eternally engulfed in big band bombast. 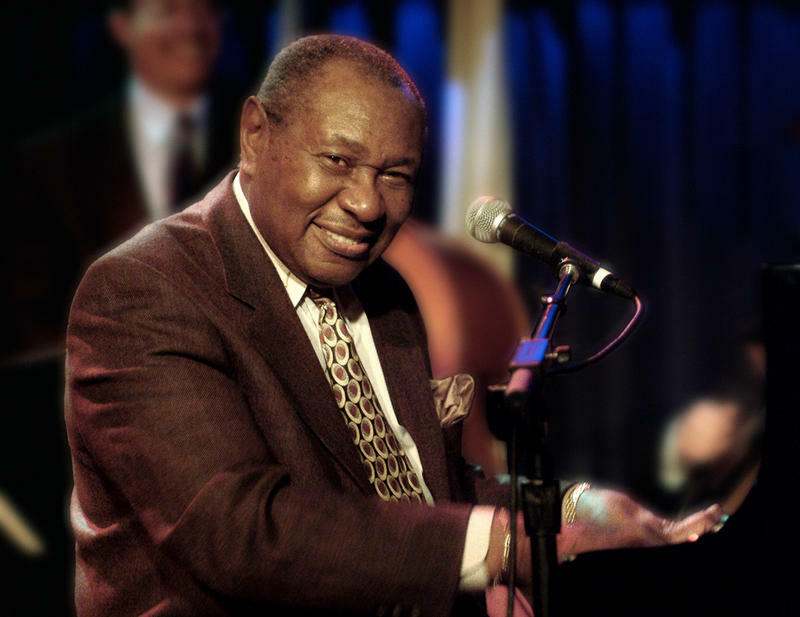 “I think Ed even dreams jazz, and he always knew all the musicians. We had bandleader Stan Kenton even visit our house when we were newlyweds,” she recalled. What finally turned her on to jazz was when Ed gave up trying to sell her on the artistry in rhythm booming through the Kentonian sound and fury. 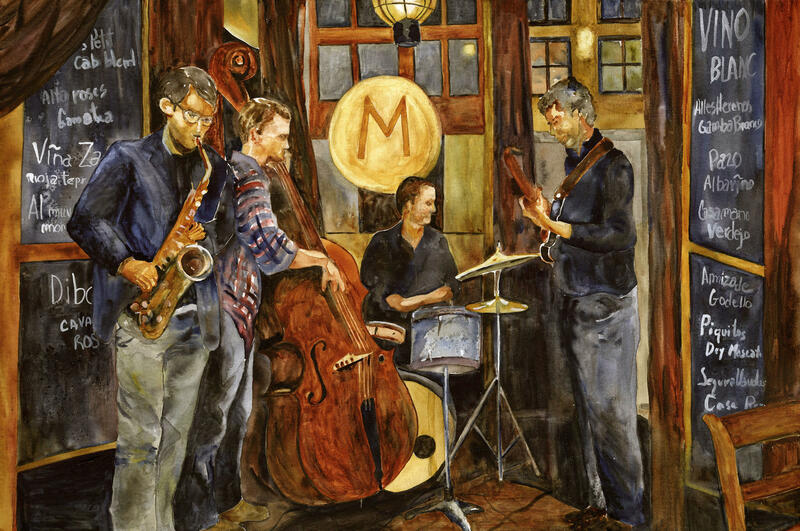 Surrendering, Ed introduced Marge to combo jazz with its quieter, nuanced stress on melody and lyricism. Since then, Marge has been hopelessly hooked. 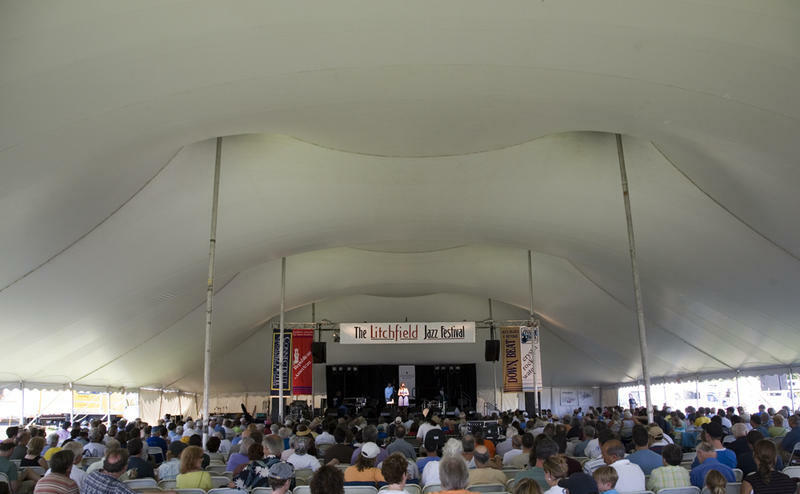 Both she and Ed are avid followers of the thriving local jazz scene in Western Massachusetts and beyond. Marge’s painterly but realistic works often infuse even inert objects with virtually human-like qualities through her knack for pictorial personification. Quite remarkably, she pulls this off with a close-up portrait of just the keys and the bell of Claire Daly’s baritone saxophone whose bold, outward characteristics mirror those of its spirited, inventive owner. “I thought the painting of the saxophone, with its Claire-like dynamism, was like painting a portrait of Claire herself,” she explained. Bride’s eye-pleasing images, which have been widely exhibited in the region and graced magazine and CD covers, are upbeat and joyful. Melancholy has no dominion in Marge’s magical watercolor kingdom. Her sleight of hand can capture the spirit of anything from a stately, memory-filled manse to the riffing, raffish bohemian aura of a jazz club. You can almost hear the sounds behind the doors of her favorite jazz nightspots, taste the top-shelf booze and sense the soulful vibe. 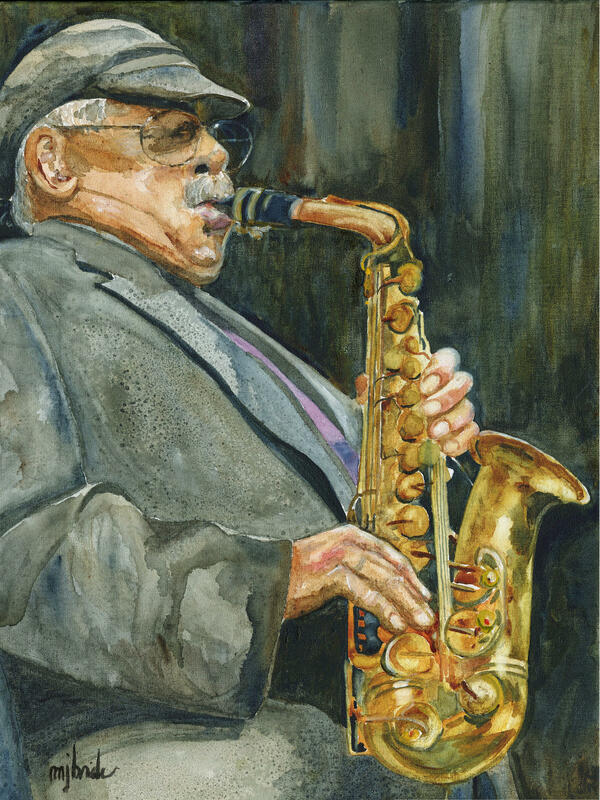 With her individual portraits of musicians, you can savor the visual dynamism emitted by master soloists like Phil Woods or Dave Brubeck, two of her subjects in Jazz Visions. Just as with her earlier nursing and software careers, painting is a serious, full-time job. It’s a room of her own. There she can draw, paint, take care of routine business or instruct private students. “Ed and I have a late breakfast,” she said, expanding on the daily regimen in the Bride household, an empty nest now with all three of their adult children out on their own. “After breakfast, Ed goes to his office on the second floor, and I go downstairs to my studio. At noon we rejoin each other for lunch. Then it’s back to work,” she said. “I loved drawing when I was a kid, and later I was the arts editor for a newspaper in nursing school. In high school, I thought about going to Rhode Island School of Design, but that never happened,” she said. “She found me a teacher and bought me some art supplies. I had no clue that this was going to be a third career—absolutely none,” she said. Bride's painting of The Castle Street Cafe. Now with unstinting passion and confidence, Bride captures the essence of bustling market places, idyllic farmlands, lighthouses, street scenes, quaint New England villages, hip jazz dens, serene still lifes and luminous moonscapes, snow-scapes and seascapes for her poetic imagination to stroll on.